The term “aerobic treatment” refers to biological manure treatment processes that occur in the presence of oxygen. In these processes, aerobic microorganisms oxidize bio-available organic and nitrogenous compounds. Removal of these oxygen demanding compounds provides a means to reduce odor emission and to reduce ammonia emissions. Aerobic treatment has not been used much in treatment of liquid or slurry manure primarily due to the costs associated with operating the motors, compressors or fans required to supply enough oxygen to support aerobic bacteria. The amount of aeration needed (in increasing order) depends on whether it is desired to just reduce odor, or completely remove the oxygen demand of the organic matter, or to supply enough oxygen for oxidation of ammonium to nitrate (nitrification). Advantages of aeration include the potential reduction of emissions of odor, methane (a greenhouse gas), and ammonia. Nitrification of ammonia to nitrate also has the advantage of conversion to a nitrogen form that is readily crop available, although it is also more prone to leaching. 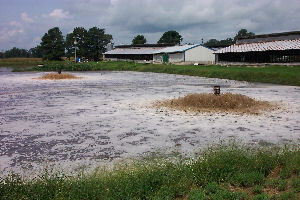 The nitrate can also be biologically converted to nitrogen gas in the presence of organic compounds, resulting in nitrogen removal from the liquid or slurry. 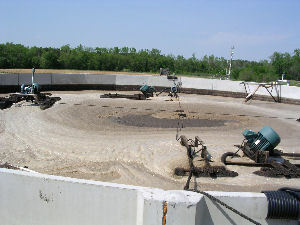 Surface aerators and mixers used in Sequencing Batch Reactor treatment of flushed pig manure. Disadvantages of aerobic treatment include higher capital cost for aeration equipment, higher operating cost (particularly energy for pumps or aerators), higher maintenance requirements, and possibly monitoring requirements for checking the dissolved oxygen level in the liquid. There are various methods and types of equipment for aeration, whether in a tank reactor or in an aeration pond, and selecting the most efficient equipment and methods may be difficult. There are also various designs to maintain the aerobic bacteria in sufficient quantity, such as attached to suspended solids or on fixed media. Consultation with knowledgeable professionals is advisable. LPES. Lesson 25: Manure Treatment Options. LPES. Lesson 43: Emissions control strategies for manure storage facilities. Section 4 Biological Processes. Lorimor, J. Manure Treatment. Environmental Issues in Livestock Production, Home Study Course, Lesson 5. Iowa State University, Ames, IA. Zhu, J. Frequently asked questions about aerobic treatment. University of Minnesota, Dept. of Biosystems and Agricultural Engineering. Sheffield, R. Powerpoint presentation on aerobic treatment systems. NC State University. Development of environmentally superior technologies (Smithfield/PSF/FLF agreement).